Fast bowling is on a decline, and this is a tribute to a few good men who have entertained over the years with their raw pace. Fast bowling is the prime reason why cricket has survived over a century now. Cricket is said to be a batsman’s game, but a batsman cannot score runs if there is no contest between him and a fast bowler. There has to be atleast one extreme quick in a team. He is the one responsible to provide a stiff challenge, and as a result make cricket a lovable sport to many. So, the focus will be on which cricketers actually qualify in the category of being the fastest bowlers of all time and in all formats of the game. This fiery Kangaroo remains one of the legends in world cricket, and this is due to the pace he generated with almost every ball he bowled till the end of his career. He could be considered as the pioneer of ‘real’ fast bowling in Test cricket, although in his times West Indies were developing a strong pace battery which would go on to rock world cricket for a decade and a half. Lillee had the advantage of only playing Tests since he made his debut in 1971 at a tender age of 22. Yet, his pace was humungous enough that he suffered from stress fractures on a regular basis throughout his career. He managed to finish with 355 wickets at the end of his career in 1984, a world record at that time by far. Lillee could also considered as the man who promoted sledging in the Australian side, with his aggressive attitude with the ball combined with his short temperament. One of the most infamous incidents of cricket involved Javed Miandad almost hitting Lillee with his bat, after he was said to have deliberately attempted to stop Miandad from taking a second run in a Test at Perth in 1981. Despite all this, Dennis Lillee remains one of the most respected figures in the game and it does not come as a surprise that he has lent out support since the last two decades at the MRF Pace Foundation in Chennai, helping develop young Indian fast bowlers. Thomson formed one of the finest new-ball partnerships in Test cricket with Lillee. They were so fearsome, it was as if both of them were competing as to who bowls faster at a consistent rate which proved to be extremely healthy for Australia. In 1978, Thomson clocked a staggering 147.9 km/h, ahead of the likes of the dangerous Michael Holding and Imran Khan. Some experts and cricketers such as Rod Marsh, who kept wickets to Thomson frequently, say that Thomson’s fastest ball is at 180 km/h! Incredible as it may sound but he was capable of demoralizing the batting side within a span of few overs. After all, he said once ‘I like to see blood on the pitch’. No wonder then, it was in his era that pace bowlers dominated more than spin bowlers and it also co-incided with Australia becoming a cricketing giant while the West Indies were in the hunt to gain world dominance. However, problems with injuries, form and World Series cricket gaining massive popularity during his time were good enough to allow him play only 10 years of cricket. He finished with exactly 200 Test wickets, though he could have achieved more as he has the potential to become as legendary as Lillee. Brett Lee is the third Aussie to make this list. It goes to show how much Australia has contributed in the growth and survival of pace bowling till date, and how they used it as strength to become champions in world cricket for 15 years. The New South Wales quickie could be considered as an ideal successor to Lillee with the impact he can make with the ball, as he is all about bowling fast consistently. He broke into the Test side in 1999 against India, and took 13 wickets in his first two Tests shocking even star Indian batsmen such as Rahul Dravid and Sachin Tendulkar. In the decade between 2000 and 2010, Lee is definitely the second fastest bowler after Shoaib Akhtar. Although it is entertaining for any cricket fan to see an express delivery shatter a batsman’s stumps, Lee has relied too much on his pace to pick up wickets. As a result, he has suffered from innumerable injuries throughout his career. It all started with a back and elbow injury after just one year of international cricket. And then in 2008, when he suffered from an ankle injury and stress fractures on the left foot. He did make a comeback of sorts from those injuries for the Ashes 2009, but again fate was not on Lee’s side as picked up a left side strain and a sore rib, which prompted him to retire from Tests a few months later and solely focus on ODIS and T20s. That has helped to a huge extent as Lee has begun to look threatening as before, by clocking 145 km/h on average, on a regular basis. It is because of him that Australia is still the No.1 ODI side in the world rankings. Despite having turned 35 recently, we can hope to see Lee give shivers to any batsman in the short-run as he also plays for the Kolkata Knight Riders in the IPL, and Sydney Sixers in the nascent Big Bash competition in Australia. And Shaun Tait is the final Australian to feature in this list. He is only 28, yet he has retired from Tests and ODIs, available only in T-20s for Australia and for his club sides such as Rajasthan Royals and Melbourne Renegades. This is due to the emphasis he gives on bowling extremely fast all the time, double than that of Lee. 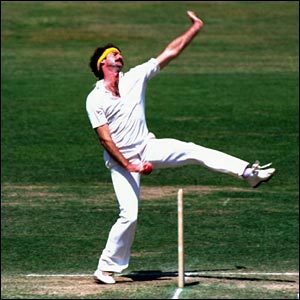 Due to his slingy action, he is able to generate balls clocking 150 km/h and has prompted many to call him ‘The Wild Thing’, similar to Jeff Thomson. He has the record till date to have bowled the fastest ball in Australia, by bowling one ball at an astonishing 160.3 km/h against Pakistan in a T-20 international in 2010. And the second fastest ball in ODI cricket which was against England at Lords in the same year, where he clocked 161.1 km/h. Although many criticize him for being erratic with his line and length and giving away runs easily, he is his team’s strike bowler as his captain would want him to attack by picking wickets rather than containing runs. 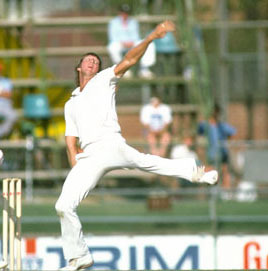 Tait has unfortunately suffered from persistent shoulder and elbow injuries throughout his Test career. As a result, that came to an abrupt end in the 2007-08 season itself after a decent debut in the 2005 Ashes in England. Even in the ODIS, he lasted just four years but Tait will be remembered the most for surprising batsman with his pace, even on slow wickets. 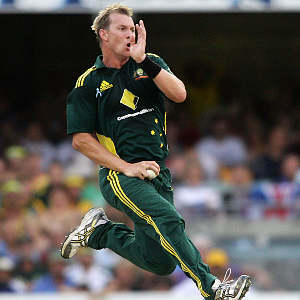 An evidence of this is his 23 wickets at a miserly average of 20.30 in Australia’s successful World Cup campaign in the Caribbean in 2007, when he ended up as the second highest wicket-taker of the competition despite his inexperience and the fact that Australia had to contend with the absence of Brett Lee. Apart from that World Cup, Tait has astonishingly featured in a few ODIs for Australia and that was primarily because he had the backing of Ricky Ponting to pick wickets all the time, when in full fitness. In fact, it was fitness issues which caused Tait to announce his retirement from ODIs after the 2011 World Cup. But he will continue to play for Rajasthan and Melbourne and rattle batsmen in the 4 overs he bowls every game and that would make any fan’s moneys worth! Fastest bowler in International Cricket till date. Of course, who can forget to mention Shoaib Akhtar in this list? Although Pakistan is also known to produce legendary pacers such as Imran Khan and the two Ws, i.e, Wasim Akram and Waqar Younis, there is no thrilling sight then to watch Shoaib Akhtar run from almost the sightscreen into the crease to and fire a ball into a batsman who must be already shivering within. He is by far the fastest bowler in international cricket till date, and his pace is what he will be remembered for as he entertained fans throughout his career. He bowled a delivery of 161.3 km/h in a World Cup match in 2003 to England’s Nick Knight, which is the quickest ball ever bowled in all forms of the game. He has been the ‘bad boy’ of Pakistan cricket with controversies regarding his bowling action, where he is considered to chuck and actually throw the ball, rather than bowling to a batsman. Still, whenever he played, Shoaib was the bowling spearhead for Pakistan and his deadly spells were instrumental in helping his country win on several occasions, atleast in ODIS. As in the cases of Lee and Tait, injuries cut short Akhtar’s Test career as he only featured in 46 Tests. If he would have relied more on his line and length, he could have picked more than 178 wickets. 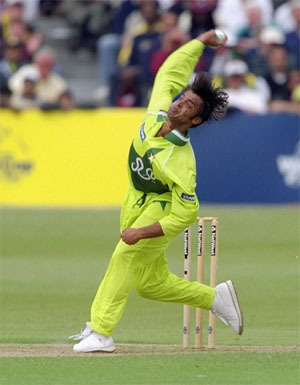 To increase his longevity in the game, Shoaib decided to reduce his run up and then try bowling at a quick pace. However, the ‘Rawalpindi Express’ was derailed by then and he did not turn out to be as effective as he was, when he first burst on the international scene in 1999. He did not feature in many matches in the World Cup 2011 and consequently quit after the tournament. There are others who can make it in the list such as Dale Steyn and Steven Finn as examples but fast bowling is on a decline as pitches these days are getting slower and slower while batsmen make merry of the new rules the ICC comes out with time and again. The ICC and cricket boards have to assure that there are less number of matches played throughout a calendar year, so that player workload is reduced and we can see the development of talented quickies such as Umesh Yadav, Varun Aaron and Patrick Cummins who have shown immense promise in recent times with the pace at which they have bowled. Dude it was really good but I wanna tell you that there are certain mistakes such as Shoaib Akhtar never bowled at a speed of 163km\h..The fastest ball in the history of cricket is 161.3km\h which akhtar bowled to England’s Nick knight during 2003 world cup….you need to check out all these important things…But we can not underestimate the likes of Lille,Ambrose and Thompson as in those days there was no speed machine and they could have really bowled at a speed of 150+ km\h…. But where is the mistake Darshan? It doesn’t say 163 km/hr anywhere. It’s 161.3 only. Not sure of the point of this article. As someone has already pointed out some of your basic facts are wrong if it purely about speed. Surely at the end of the day has to be about wickets and more importantly the impact of taking wickets on matches. Towrds the end of your article you even imply that it is not objective as pure speed by mentioning some of the players that could be included. So I realise that all these type of things are a matter of opinion, but really four Australians in the top five? What about, Marshall, Garner, Holding, Ambrose, Walsh all arguably as good if not better than the five you have named. (As far as I am aware Marshall still has the best strike rate of any test cricketer with over 200 wickets) That is before we even begin to consider Pollock, Donald, Hadlee, Dev, Trueman, Larwood, Steyn, Akram and Younis, many of whom have better test records than several of the players you mentioned. The inclusion of Tait is almost laughable. If you have to include an Australian quick surely McGrath is head and shoulders above any of the ones you have included. But you can’t have a list of “fastest bowlers” and not include any speedsters from the West Indies teams of the 1980 particularly Marshall. Dale steyn is the best fast bowler in the world. hey!!! what is Bret Lee doing at three? I believe he is the best bowler!!! he threw the bowl at that speed ! Lillee was never the fastest of fast bowlers. Does not belong on the list. No Indian in this list, India is MUTHAL country. hey! where is mohamad SAMI? article title is fastest bowler not the best bowler and yet the ranks r based on fame and not on speed , shoaib shuld be on Top he has bowled the fastest then bret lee and so on , if you put fastest yet the most sucessfull then others would take place too , i think the article lost its accuracy . There are a couple you missed. 1. Harold Larwood. Although without speed guns, you show a video of him to a modern player and they all nod in approval of what was a very fast man and the only one who really inconvenienced Don Bradman. 2. Frank Tyson. Reckoned by those who saw him as the fastest there has ever been, and most of those commentators were around to see the Ausrtalian girls Lillian Thompson. The days of Lilly and Thomson didn’t have helmets. A good eyesight let a batsman to leave crease. Short pitched balls meant only calamity. Sitting ducks were the batsman without protection.